Fr Hunwicke's Mutual Enrichment: Meet on Monday?? Deo volente, I shall be celebrating a High Mass of the Assumption on Monday at 7.00 p.m., in the Central Ordinariate Church of the Assumption and S Gregory, Warwick Street in London. 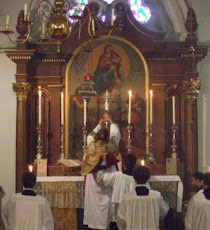 The Mass will be in the Latin Tridentine Rite; it would be jolly to meet any reader who happens to be in London on Monday for the Assumption (in England, the actual Obligation is transferred this year to Sunday August 14). Since it will be the Solemnity of the Titular of a Parish Church, our Blessed Lady Assumed into Heaven, you could also kill two birds with one stone by collecting the available Plenary Indulgence suetis condicionibus!! Many will know that this historic church was once the Bavarian Embassy Chapel, and has therefore hosted down the years many celebrations related to our de jure Royal House. It had the great distinction of being sacked during the Gordon Riots. If the Sanctuary looks a bit familiar, that is because the architect of Westminster Cathedral, J F Bentley (1839-1902), rebuilt that end in what looks like a trial run for the Cathedral. If you like that sort of thing, you may very well like it. The rest of the church (as well as its unassuming frontage to the road) looks, with its galleries, reassuringly like a Methodist Chapel. However, what I particularly enjoy is a relief of our Lady's Assumption, which is a relic of the Georgian or Regency fittings before Bentley started striking blows for Revived Byzantine. This relief was originally over the High Altar but now lives over the door to the left of the Altar, which leads to the sacristies. It is pure nineteenth century neo-Classicism, carved by John Edward Carew (1785-1868). Yes ... I know you've heard of Flaxman and Chantrey and Westmacott, but ... Carew ... ? I don't know whether Carew did many other Catholic ecclesiastical commissions, or how he came by the Warwick Street job. But I think it's worth making the effort to come and look at it. And, of course, on Sundays you could combine a visit with an experience of the splendid Ordinariate Rite. I do regret being unable to attend but I have to serve an early morning Low Mass on Monday in Launceston, and cannot make it to London in time. Of your charity, please do provide those not physically present at your Mass for the Assumption with the text of your homily. There is a Carew relief in the baptistry at St John the Baptist here in Brighton. I was originally the altarpiece. I shall endeavour to be there but may be arriving late. There's a fine John the Baptist in the church of that dedication in Brighton. Lovely mass Reverend Father, and the church is very inspiring. Petworth actually has some black Kilkenny marble used in the hallway: I had not realised that the architect was Irish, which would explain this - another reason to visit. Julie ... I saw you in the Church; but by the time I had extricated myself from that very heavy Spanish Chasuble and dashed to the door, I couldn't find you! In future, I shall know to hang around: I wasn't sure what the ordinariate protocol is. Just back from Ireland, and an interesting couple of masses at the ICKSP in Limerick and St Kevin's in Dublin: recommended. Very orthodox sermons. Our own PP has been very good as usual: I observed that his "quoque" and "non" are impeccably pronounced, and on Sunday a couple of weeks ago, he even complained about the accuracy of some of the English translation of the gospel! He is a discerning former Anglican, of course.